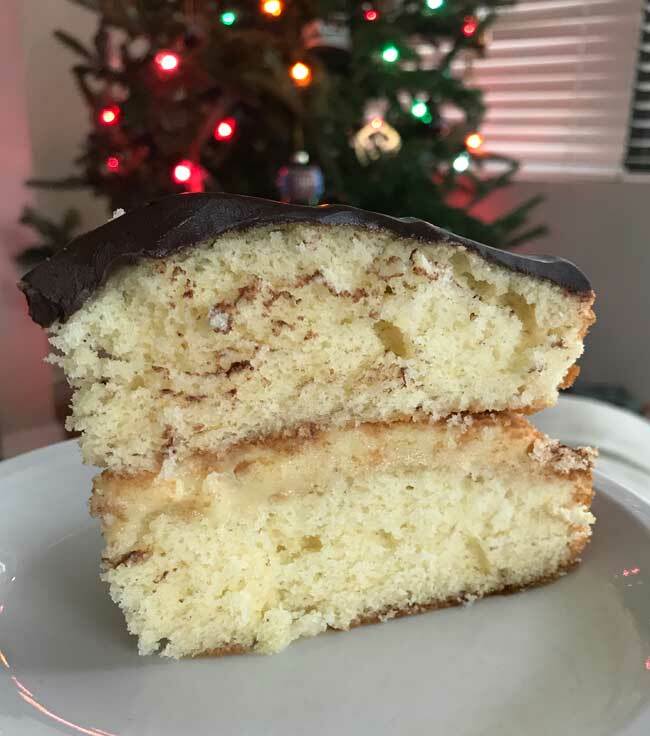 My idea of Boston Cream Pie is two layers of golden sponge cake filled with pastry cream and topped with chocolate glaze, but some recipes don’t quite fit the template. This is one of those recipes, and I love it for a few reasons. First, the cake is a yellow cake rather than a sponge and it’s the kind where you mix all the dry ingredients and just pour in the wet. You do have to beat the egg whites and fold them in at the end, but the recipe still comes together pretty easily with just a handheld mixer. 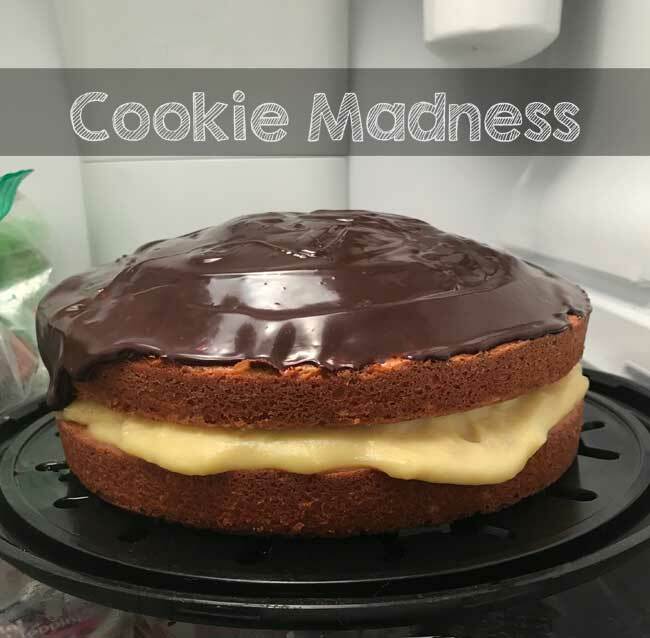 I also like this Boston Cream Pie because it’s relatively inexpensive and I almost always have the ingredients. Both times I’ve made it I’ve started during the late afternoon when I was looking for a project using things in the pantry. That’s also why I took the final picture in the refrigerator. The cakes were done in the evening and I didn’t have any good natural light. So even though this isn’t quite the classic Boston Cream Pie, it’s a really good one. And like most Boston Cream Pie, it freezes very well, so that’s another bonus. Separate the eggs and put the whites in metal or glass mixing bowl. Set yolks and ½ cup of the sugar aside. In a large mixing bowl, combine the remaining 1 cup sugar, the flour, baking powder and salt. Whisk dry ingredients for about a minute so that they are very thoroughly blended. To the flour mixture, add the 1/3 cup oil and egg yolks and stir until gloppy, then add 1/3 of the milk and stir until blended, thick and lumpy. Add remaining milk in two parts, stirring after each addition, until mixture is smooth. Add vanilla and beat with a heavy duty scraper for about 40 strokes. With a handheld electric mixer, beat the egg whites until foamy, then gradually add the sugar and continue beating until thick. Fold the beaten egg whites into the batter. It should be smooth and silky. Divide it evenly (about 450 grams per pan) between the two pans. Bake at 350 for 25 minutes. Let cool in pans for 10 minutes, then invert onto a wire rack and let cool completely. In a large saucepan (I use a 3 quart metal saucepan), combine the sugar, flour, and salt. Gradually stir in the milk. Set the mixture over medium heat and bring to a bowl, whisking constantly. With a measuring cup, spoon out about 1/3 cup of the hot milk mixture and stir into the beaten egg. Add a little more of the milk mixture to the egg, then add the egg mixture to the saucepan, whisking all the while until mixture returns to a gentle boil. Remove from heat and stir in butter and vanilla. Transfer to a glass bowl and cover with a sheet of wax paper or parchment and let cool. For the glaze, combine 1/3 cup of heavy cream and 1 tablespoon of honey or corn syrup in a 2 cup glass measuring cup. Heat in the microwave for about 30 seconds or until the cream is very hot, then stir in 4 oz of chopped semisweet chocolate. Stir until smooth and creamy. At this point it will be kind of thin, so let it cool down to a slightly thicker consistency and spoon over the cake. Place 1 cake layer on serving plate. Spread with pastry cream. Top with second cake layer and pour glaze over the top. This one is adapted from one by James Villas, though I took some liberties with the icing and made it a chocolate ganache instead of a glaze. That’s really cool, and I learned something about Boston Cream Pie! I didn’t grow up with it and it doesn’t really appeal to me, but I know that probably sounds crazy to people who love it!